Today I’d like to share with you two cards that were created with the new “In This World” stamp set. You will also see two different techniques showcasing the individual stamps in the set. First you will see the beautiful butterfly; hand colored and cut out to create the focal point of the card. Behind the butterfly you will see the soft watercolor effect done in the same color as the base of the card … this really ties the entire card together and makes the butterfly just pop! I love how the card was accented with a swirl of linen thread and beautiful Metal Rimmed Pearl. The second card uses the stamped images to create a collaged look!This is done by simply layering stamped images … you must try it, it’s really fun. 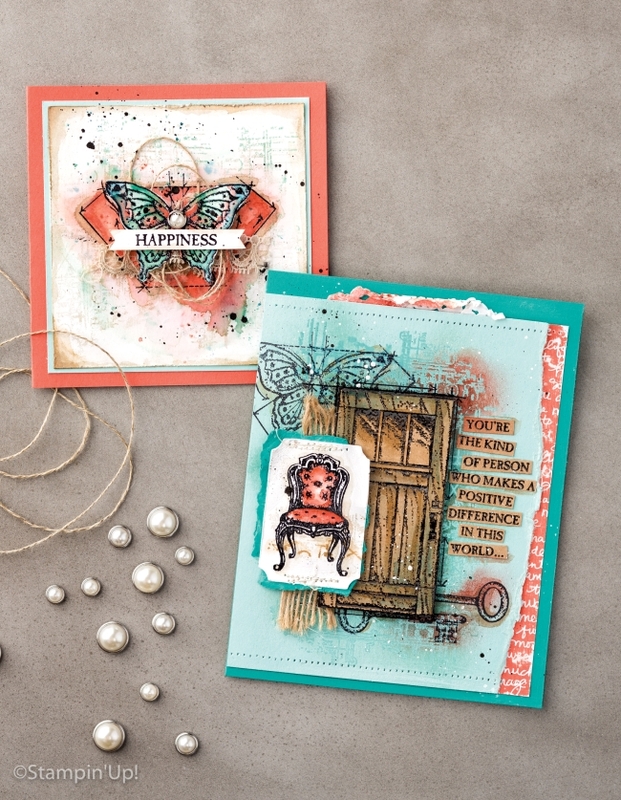 I love how the door is highlighted by coloring and then the chair is used as the focal point to draw your eye to the card. So two great technique used on this stamp set to create totally different looking cards. I’m sure you could easily come us with even more ideas!